In the main property details screen you will see an Owner Details widget. Click the top bar to open it if it’s closed. A property can have one or more owners or vendors, thus the vendor is treated as a Group comprising one or more individuals. The group will contain a Primary Contact (by default the first name added) and can have a name and email address in its own right. For example, if the seller is a company, one or more company employees will need to receive communications from BDP, so the group is the name of the company and the group members are those employees responsible for the property. The widget contains a set of tools in the top right that relate to group actions that affect all sellers, and each individual member of the group can be edited separately by clicking the pencil to the right of their entry. If there are two or more members of the group, clicking the ‘head’ icon next to an entry makes that person the primary contact. The primary contact will appear first in all correspondence and in some situations will be the only member of the group to be contacted. Clicking the @ icon in the widget toolbar will bring up the email panel to send an email to all vendors. 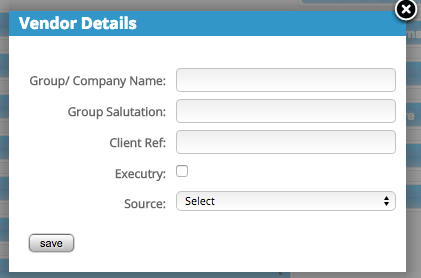 Clicking the bell icon will set a call reminder to contact this vendor at a future time specified by the user. Clicking the ‘plus’ icon adds another vendor to the group.